Having been bowled over by Matthew Bourne’s "Swan Lake" in February, his latest work, “The Car Man” was one of our must-sees. We postponed the end of our trip just to include the first preview of “The Car Man” (although it had already had previews in Plymouth from May 16, playing opening June 18 and running to the 28th). The ending of both acts was very exciting, but I couldn't avoid thinking that the ballet as a whole was not as remarkable as "Swan Lake". Moving "Swan Lake" from a mythic Germany to an alternative contemporary London is much more an imaginative leap than transposing the story of Carmen from a gritty setting in 19th-century Spain to a gritty setting in the 1950s American Midwest. The toreadors are now car mechanics and the cigarette girls now work in a diner. Carmen's role has been divided somewhat pointlessly between a femme fatale and an homme fatal. Composer Terry Davies has expanded Rodion Shchedrin's 40-minute score to a full two hours and, unlike "Swan Lake" this ballet seemed to suffer from padding. A drag race scene in Act 2 comes to nothing and the men's various displays of machismo and the women's displays of lewdness eventually become repetitive. 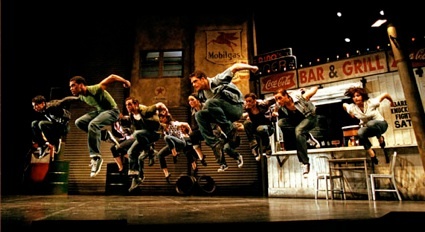 The dances themselves are like more angular versions of Jerome Robbins' dances for "West Side Story". Bourne's troupe shows once again that they are expert as actors as well as dancers. All five principals for the performance I saw--Scott Ambler, Saranne Curtin, Emily Piercy, Arthur Pita and Ben Hartley in the title role--were excellent. Pita was especially impressive as Angelo, the role with the widest emotional range. While "Swan Lake" had psychological depth and the impact of tragedy, THE CAR MAN ultimately lacked both. Where I was totally drawn in in the earlier ballet, I felt distanced from the action in the new one. I was interested to see Bourne trying out a film noir style in a realistic setting, but it seems that fantasy draws more insight and inventiveness from him. Note: A version of this review appeared in the London Theatre Guide 2000-12-31. Photo: Ensemble of The Car Man. ©2000 Adventures in Motion Pictures.